Here comes Peter Cottontail, hopping on down the bunny trail to your next event! 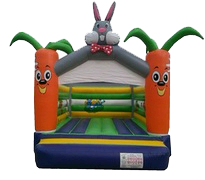 Enjoy your party with this front open & sky view funjump! The weight limit for this jump is 500lbs. This rental's based price is for 6 hours. If additional rental time is needed we do offer overnight rental which is 25% extra.